Figure 1. An example of one of the diseases identified for the first time in NY as a result of the survey. Surveys of soybean diseases in New York were initiated in 2012 with support by the Northern New York Agricultural Development Program (2013-2016) and the New York State Corn and Soybean Growers Association (2013-2015). The survey was coordinated by Cornell University’s Field Crops Pathology program under the direction of Dr. Gary Bergstrom and Research Support Specialist Jaime Cummings in collaboration with numerous Cornell Cooperative Extension Educators and countless soybean growers throughout the state. The purpose of the surveys was to gain a better understanding of the occurrence and distribution of soybean diseases affecting NY growers and to document and monitor the expansion of diseases to new areas. All distribution maps are based on a positive laboratory diagnosis of the causal microorganism associated with observed symptoms. Actual ranges of disease occurrence may be wider than appears on these maps but have not yet been confirmed through vigorous laboratory diagnoses. The results of this ongoing survey are now available in the soybean disease section of Cornell’s fieldcrops.org extension website https://fieldcrops.cals.cornell.edu/soybeans/diseases-soybeans/soybean-disease-survey. Through the efforts of this survey, a total of seven diseases previously undocumented in NY were discovered and confirmed. These diseases included charcoal rot, Fusarium wilt, sudden death syndrome, brown stem rot, northern stem canker, bacterial wilt and powdery mildew. The soilborne diseases identified are of particular concern to growers. Knowing where these diseases have been confirmed will aid growers in making decisions on selecting varieties with resistance and other management options for diseases of potential importance in their areas. Multiyear surveys better capture the reality of disease occurrences in the region due to the variation in weather from year to year, because each disease may be favored by specific weather conditions. We will continue the soybean disease survey in 2017 to expand our database and knowledge of which soybean diseases occur throughout NY. The website, updated annually, outlines the progress of the survey, including the locations included in the survey, the number of samples diagnosed and the primary diseases identified each year. New York soybean growers can use this new tool to find information on which diseases have been identified in their respective counties, along with information on each disease including epidemiology, diagnostic characteristics for in-field identification, and management options and recommendations (Fig. 1). The Comprehensive Assessment of Soil Health (CASH) provides a framework for measuring the physical, biological and chemical aspects of soil functioning. 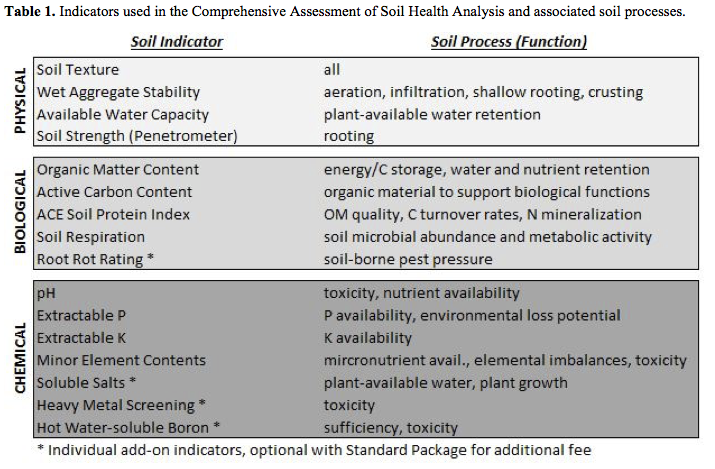 The assessment includes specific measurements, selected from an original list of 42 potential soil health indicators, evaluated for their relevance to key soil processes (Table 1), sensitivities to changes in management, and cost of analysis. As a framework, CASH encompasses not only soil health testing, but also outlines field-specific planning strategies and management approaches. In 2016, the Cornell Soil Health Laboratory released the third edition of the Comprehensive Assessment of Soil Health Training Manual (bit.ly/SoilHealthTrainingManual) (Fig. 1). The manual contains information on introductory soil health concepts, a detailed discussion of individual soil health indicators, laboratory procedures, a step-by-step guide to our soil health management framework, and an extensive list of additional resources. Figure 1. 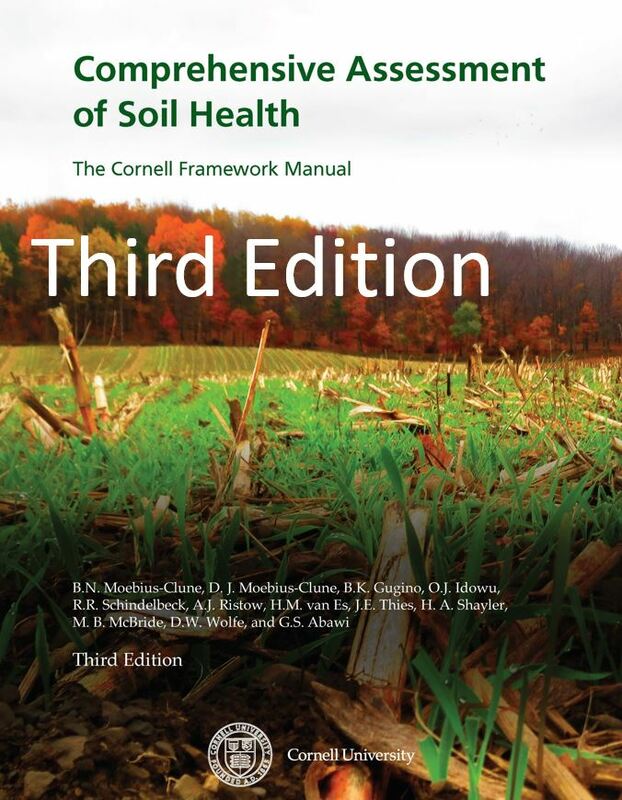 The third edition of the Comprehensive Assessment of Soil Health Cornell Framework Manual is now available. Printed copies can be purchased or it can be downloaded for free from the CASH website. Out of this training manual, we have developed the Soil Health Manual Series of Fact Sheets (bit.ly/SoilHealthFactSheets) to further facilitate the guide’s utility as an educational tool for growers, extension agents, and Ag Service Providers. The fact sheets are one page, two-sided handouts, designed to explain different soil health concepts and show how we measure soil health. Purveyors of soil health can easily download and print the sheets to be handed out at field days and other outreach events (Figure 2). They are available on the CASH website (http://soilhealth.cals.cornell.edu/).The entire collection is also available as a booklet or “mini-manual”. Figure 2. 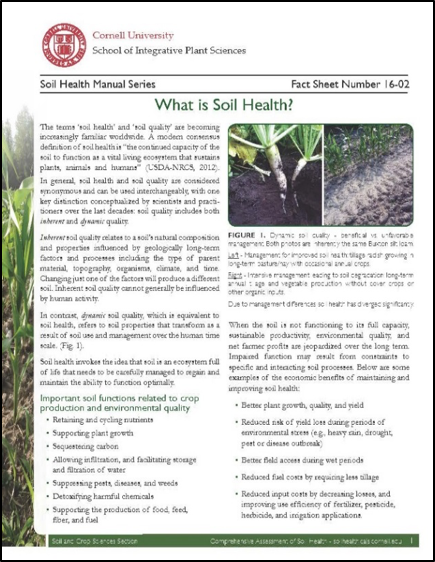 The Soil Health Manual Series fact sheets are designed to explain different soil health concepts and show how we measure soil health in downloadable, one page, two sided, easy to read handouts. Below are links to the fact sheets that are currently available online. New handouts will be posted as they are added to the series. 16-02 – What is Soil Health? 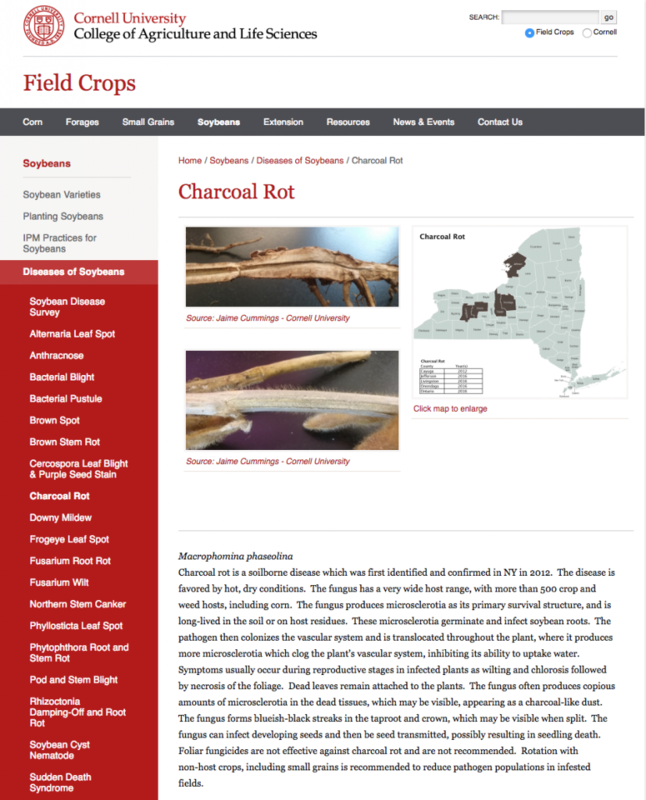 For more information, please visit our website: soilhealth.cals.cornell.edu. 1 Soil and Crop Sciences Section, Cornell University; 2Millersville PA, 3Willard Agri-Service, Inc.
Digital agriculture is a new concept that focuses on the employment of computational and information technologies to improve the profitability and sustainability of agriculture. A promising opportunity is the use of advanced analytical methods on data that are routinely collected on farms, which allow insight into ways to improve management. One example is the use of combine yield monitor data that are now customarily collected as part of harvest operations. Crop fields have high variations in crop performance due to varying soil types and topography, which interact with climate and management. A major objective of most growers is to maximize profit. Understanding the underlying profitability potential in varying areas of agricultural fields allows managers to construct zone-specific strategies using information on yield potential and yield-constraining factors. One might consider two management interventions to optimize profitability: (i) take field areas that are known in advance to be unprofitable out of crop production, and (ii) make underperforming field areas more profitable through improved management implementation. Therefore, our objectives were to (i) evaluate the variation in spatial patterns of within-field profitability as well as field-average expected profitability, and (ii) determine opportunities for site-specific management change to increase overall field profitability. The study fields are located in Delaware, Maryland, Virginia, West Virginia, and southeastern Pennsylvania within three physiographic provinces: Coastal Plain, Piedmont, and Blue Ridge. All fields had similar crop rotations: corn, soybean, and wheat or barley. In some cases, double crop soybean was cultivated following the harvest of small grains. Soil nutrient, pest, weed, and irrigation water management on each field was based on individual farm’s management schemes. Yield data were collected for corn and soybean on 18 fields throughout the study region with well-calibrated yield monitors on combine harvesters. The fields ranged in size from 14.3 to 115.9 acres. For a particular field, the number of growing seasons for which digital yield data were available ranged from 3 to 12, with a range of 1 to 7 growing seasons for a single crop. Irrigation occurred on 6 of the 18 fields. Post-processing of yield data was done using the Yield Editor 2.0.7 software and data were then rasterized (15×15 ft) using the SAGA function within the QGIS environment. where E[Yield] is the expected value of yield estimated from the multi-year average yield, Price is the average price of the crop (corn or soybean), and Cost is the average cost of production. We utilized the 10 year average (2004-to-2013) price of corn and soybean for the profitability calculation, which were $4.73 and $411.45 per bushel, respectively (University of Illinois, 2015). The cost of production was determined using the Farm Resource Regions (USDA-ERS, 2000) for 2014, and ranged from $590.6 to $666.7 per acre for corn and $395.3 to $437.0 per acre for soybean. We adopted different scenarios for profitability calculation for both rented and owned fields, where we subtracted the land rental rate from the total cost. We also estimated the cost of irrigation to be $138.0 per acre (Tyson and Curtis, 2008), which was added to the total annual cost of production when appropriate. In the first analysis, the variation in spatial patterns of within-field profitability as well as field-average expected profitability was evaluated. Expectedly, profitability was affected by owned versus rented field status (Table 1) in both corn and soybean scenarios. In the owner-field scenario, 76% of the field area was on average profitable compared to 57% for the rented scenario. Profitability was higher overall in soybeans compared to corn for both owned and rented scenarios, partly due to the assumed lower cost of production by approximately $200 per acre (USDA-ERS, 2015) and mostly related to the exclusion of N fertilizer cost. Irrigation effectively improved profitability (not shown here), even under rented scenarios, indicating that soil moisture shortage is a major yield limiting factor in the Mid-Atlantic region and irrigation can achieve positive profits even after accounting for the added cost. A second analysis focused on the identification of profitable vs. unprofitable zones within fields. I.e., based on multi-year yield data, can we consistently expect certain parts of the field to be money losers? We identified three general categories of within-field profitability patterns: “economically sensitive” (Fig. 1a and 1b), “distinct profitable-unprofitable zones” (Fig. 1c and 1d), and “all-profitable” (Fig. 1e and 1f). Fig. 1. 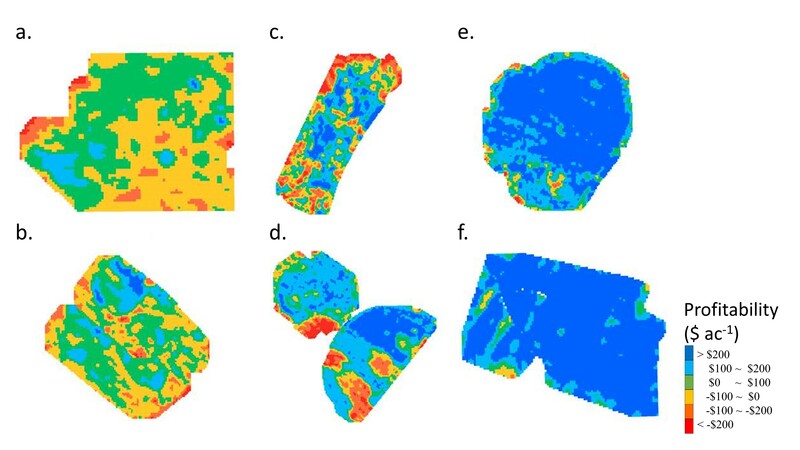 Selected maps of within-field profitability for the owned-field scenario for corn representing three profitability categories; a and b) economically sensitive; c and d) distinct profitable-unprofitable zones; and e and f) all-profitable. The economically sensitive fields generally showed high temporal variation in yield pattern due to irregular precipitation, and due to most areas being on average, either slightly profitable (Fig. 1a and 1b; green zones) or slightly unprofitable (yellow zones). This indicates that profitability at a field location strongly depends on the growing season’s environmental conditions and the relative prices of inputs and grains. The small margins in profitability suggest that modest changes in production efficiencies, grain prices, input costs, or localized yields can turn areas from unprofitable to profitable, or vice versa. For example, in fields 1a and b most profitable green zones would turn unprofitable with a $0.50 drop in grain prices. Conversely, reducing fertilizer costs through precision N management could change yellow zones from unprofitable to profitable. In fields with distinct profitable-unprofitable zones, areas exist that are either consistently profitable or unprofitable (Fig. 1c and 1d). The profitable areas (light and dark blue) presumably have favorable growing conditions, while the consistently unprofitable areas of the fields (orange and red) experience yield-limiting conditions. In some fields, money-losing zones of $200 per acre (red) existed along with $200 per acre money-making zones (blue), resulting in a $400 per acre total profitability range. The very profitable areas in these fields have higher than field-average yield potential, which may warrant increased site-specific inputs like fertilizer and possibly seed. The consistently low-yielding zones are possibly compacted headlands, areas experiencing shading from adjacent woods, damaged by wildlife, erosive or poorly-drained. Since profitability for those field zones is predictably negative, overall field profitability would be enhanced by taking those field areas completely out of production. For example, herbaceous buffer strips on the field borders or in swales could be installed to enhance environmental benefits while still providing equipment turnaround space and minimal effects on yield in the rest of the field. We evaluated the removal of low profitability areas (< -$200 per acre) from the field in Figure 1c and found an increase in overall field profitability from $41 to $63 per acre. Alternatively, potential areas of yield-constraining factors, like compaction, poor drainage or low organic matter, may be identified and managed to make those field areas profitable. For example, season-specific yield constraints were identified for the two fields in Figure 1d from excessive early-season precipitation combined with poorly-drained soil from concave field areas. Over time, improving the soil health status of these areas could make them profitable. A third profitability pattern shows field areas being all profitable (Fig. 1e and 1f). These are the most preferred conditions where no additional considerations are warranted and fields can be managed uniformly. Adoption of yield monitoring has accumulated large amounts of data. Based on our analysis of multi-year site-specific data, yields vary spatially and temporally at the field scale. We assessed within-field spatial patterns of profitability using grower collected yield data and input cost information for fields in the Mid-Atlantic USA. Three types of profitability pattern categories were identified: economically sensitive, clear profitable-unprofitable zones, and all-profitable. For fields with areas of permanent yield constraints, the removal of consistently unprofitable areas can increase overall field profitability. Conversely, high-yielding zones may justify more inputs, notably higher fertilizer and possibly seed rates. Other fields showed high sensitivity to prices and may benefit from improved management efficiencies. In conclusion, the combination of site-specific profitability and yield constraint information can inform future management optimization, including removing field areas from crop production entirely and improving management efficiencies. This article is based on a paper titled Within-Field Profitability Analysis Informs Agronomic Management Decision in the Mid-Atlantic USA (Kinoshita et al., 2016). We are grateful to the participating growers for providing the yield data. This work was supported by grants from Willard Agri-Service, Inc., the New York Farm Viability Institute and the USDA-NRCS. Kinoshita, R., H. van Es, J. Dantinne and M. Twining. 2016. Within-Field Profitability Analysis Informs Agronomic Management Decisions in the Mid-Atlantic, USA. Agricultural and Environmental letters. 1:160034. doi:10.2134/ael2016.09.0034. Tyson, T.W., and L.M. Curtis. 2008. 60 acre pivot irrigation cost analysis. Department of Biosystems Engineering, Auburn Univ., Auburn. University of Illinois. 2015. farmdoc. http://www.farmdoc.illinois.edu/manage/pricehistory/price_history.html (accessed 5 November 2015). USDA-ERS. 2000. Farm resource regions. USDA-ERS, Washington D.C.
USDA-ERS. 2015. Commodity costs and returns. http://www.ers.usda.gov/data-products/commodity-costs-and-returns.aspx (accessed 29 November 2015). 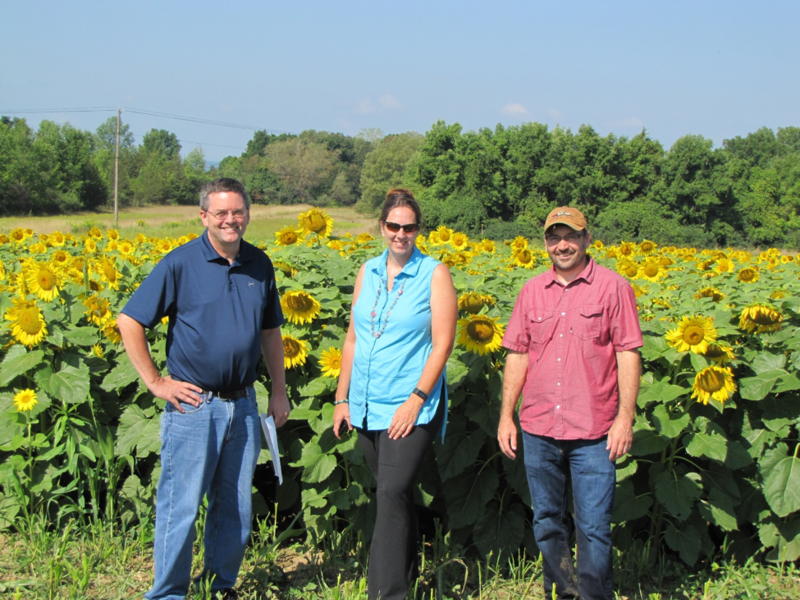 Early in 2016, the Cornell Sustainable Cropping Systems Lab met with Bob Gelser, CEO of the Once Again Nut Butter Collective, Inc. (OANB) about the feasibility of growing organic confectionary sunflowers in New York State. OANB is an employee-owned business in Nunda, NY that produces several types of nut and seed butters and other products. The company makes organic sunflower butter, but imports organic sunflower seed kernels from Eastern Europe since local, organic supply sources are currently unable to meet OANB demand. Sunflower butter currently is a popular alternative to peanut and tree nut butters that have greater allergenic potential. Mr. Gelser proposed that our lab trial organic sunflowers, to gather experience and data under NYS conditions. In general, there are two types of sunflower markets: oilseed and confectionary. Oilseed has greater oil content and is used in the production of vegetable oil, biodiesel, birdseed, and livestock feed. Confectionary has larger-sized seeds that are eaten as snacks or dehulled for food-grade kernel markets, including sunflower butter production. Smaller-sized confectionary seeds that do not make food-grade standards are often used for birdseed. Varieties suitable for both the oilseed and confectionary markets are called “conoil”. While most US sunflower production is in the Western Plains and Northern Great Plains, sunflowers have the potential to broaden and diversify crop rotations in NYS. In the most recent census, USDA-NASS reports that in 2012 NYS produced 640,000 lb of sunflowers and 50,000 lb were confectionary sunflowers. Diversified rotations may help with weed management, break pest cycles, and increase farm viability. Figure 1. Bob Gelser and Gael Orr of Once Again Nut Butter, and Dr. Matthew Ryan at organic sunflower trial on August 31, 2016. With shared interests of increasing available crop markets and diversifying crop rotations for NYS organic farmers, we started an OANB-funded research project. Since we had no experience with the crop, we designed a simple experiment (Fig. 1). We acquired two varieties, Badger DMR (downy mildew-resistant) and N5LM307, an advanced new selection, donated by the major sunflower breeder Nuseed. They are both conoil types, suitable for dehulling. The trial was relatively large, about 2 acres, and our goal was to produce at least 700 lb of kernels of each variety. This is the amount OANB needed for roasting to evaluate the quality of the seeds for sunflower butter. Growing sunflowers is very compatible with equipment that farmers use to grow corn grain. The seedbed was prepared by moldboard plowing and disking. Kreher’s 5-4-3 pelletized composted poultry manure was spread at 2000 lb/A and incorporated with a roller harrow. We used a 4-row JD 7200 MaxEmerge planter with finger pickup corn seed meters with 30 inch row spacing. The Kreher’s product was also applied through the corn planter at a rate of 220 lb/A, to give a total preplant plus starter nitrogen application of 111 lb N/A. We estimate that about half of that was available to the sunflower crop. Seeds of the two varieties were planted on June 10, 2016 at Musgrave Research Farm in Aurora, NY, at two target rates, 25,000 and 35,000/A, in a randomized complete block design. The planting was done in the midst of a severe dry spell. Only 2.00 inches of rain had fallen in the month of May at Musgrave Farm, and 0.74 inches fell in June. The first significant rainfall after planting was 0.69 inches on July 19. Nonetheless, the sunflowers emerged well, though a bit slowly. By July 1, they were big enough to cultivate, which we did with a 2-row belly-mounted cultivator that we typically use for research plots. Sunflowers are an ideal crop to mechanically cultivate because they quickly reach a height of 4-5 inches. Soil can be lightly hilled around the base of the plants to smother weeds. Because of the dry conditions, weed emergence was also low. The rows were cultivated a second and last time with a JD 4-row row crop cultivator on July 11. Sunflowers are quite drought-tolerant. They grew well through the drought and started flowering around August 15 at a height of 4-5 feet (Fig. 1). On October 7, sunflowers were deemed physiologically mature evidenced by the banana-yellow color of the back of the sunflower disc. On this date, we hand-harvested sunflower heads for moisture content and yields. Plant population data and weed biomass samples were also collected. The Badger DMR seeds had a moisture content of 13.4% and the N5LM307, 15.7% at that time. However, the discs of the heads were still quite moist, around 80%. We did the hand harvest to measure the maximum potential yield of the crop. It is likely that a fair amount of moist material would have been mixed with the seed if we harvested with the combine on that day, presenting the danger of molding during storage. Given the high moisture of the disc, we decided to delay machine harvest. We also anticipated significant losses to bird predation over the next few weeks. Plant stands were different, both by seeding rate and variety. Badger DMR established at significantly higher rates than the N5LM307 (Fig. 2). Figure 2. Average organic sunflower stands in 2016. Bars represent the standard error of the mean. Weed biomass was relatively low, though there were a few large plants that went to seed. This caused variability in the weed biomass data. Weed biomass was significantly different by variety but not by seeding rate. The Badger DMR variety had 48 lb/A of weed biomass, while N5LM307 had 202 lb/A. These low amounts of weed biomass likely did not significantly reduce yields. Hand harvest yields were high. The low seeding rate of Badger DMR yielded the most at 4260 lb/A (10% moisture). The high seeding rate of Badger and both rates of N5LM307 yielded the same at 3100-3450 lb/A (Fig. 3). 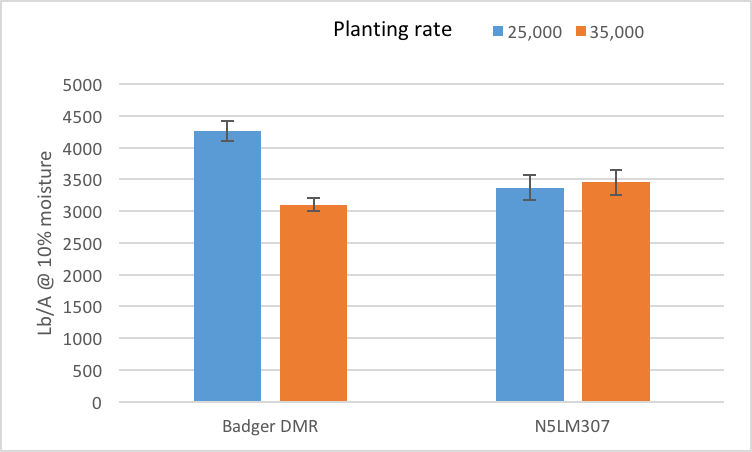 The low rate of Badger DMR may have performed better due to lower within-crop competition during the dry conditions. These yields are considerably higher than the 1000-1400 lb/A reported for dryland production in Texas. However, it should be kept in mind that this was the first year for sunflowers at the Musgrave Research Farm, and thus pest and disease populations have not built up. Figure 3. Average sunflower hand harvest yields in 2016. Bars represent the standard error of the mean. 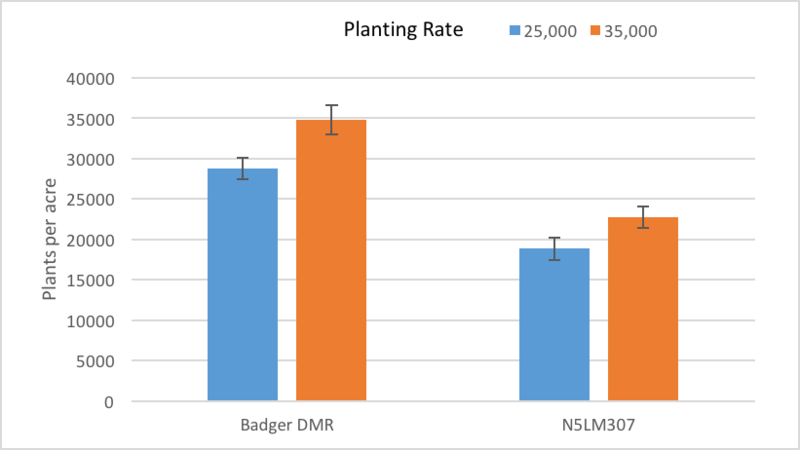 When we harvested with the combine on November 1, our bulk measurements showed average yields of 3300 lb/A for Badger DMR and 3600 for N5LM307 (Fig. 4). Evidently, there was not much loss to birds. The combine handled the crop well, leaving little trash in the harvested crop. The only modification we made to the standard corn head was to install Golden Plains sunflower plates, which direct the sunflower heads in and prevent seed loss out the front (Fig. 5). 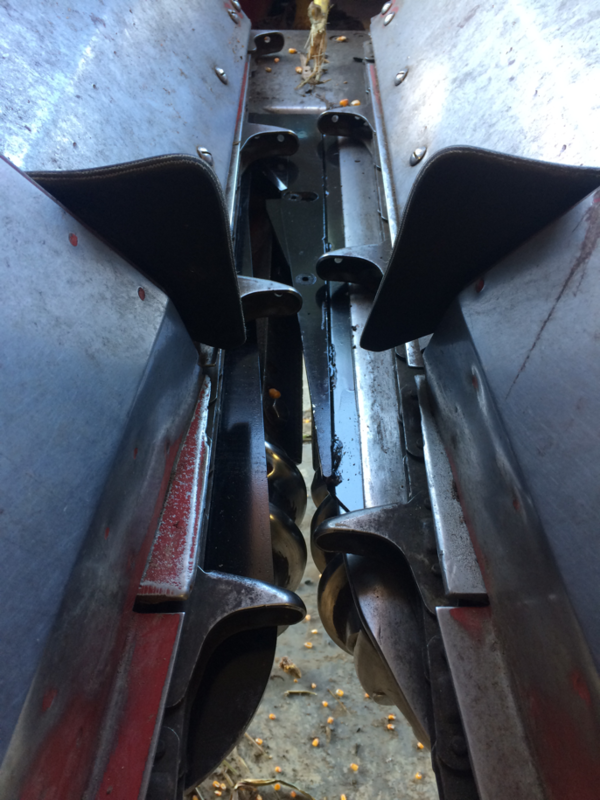 These cost $1142 used or $1693 new for our Case IH 1644 4-row combine and were easily installed. 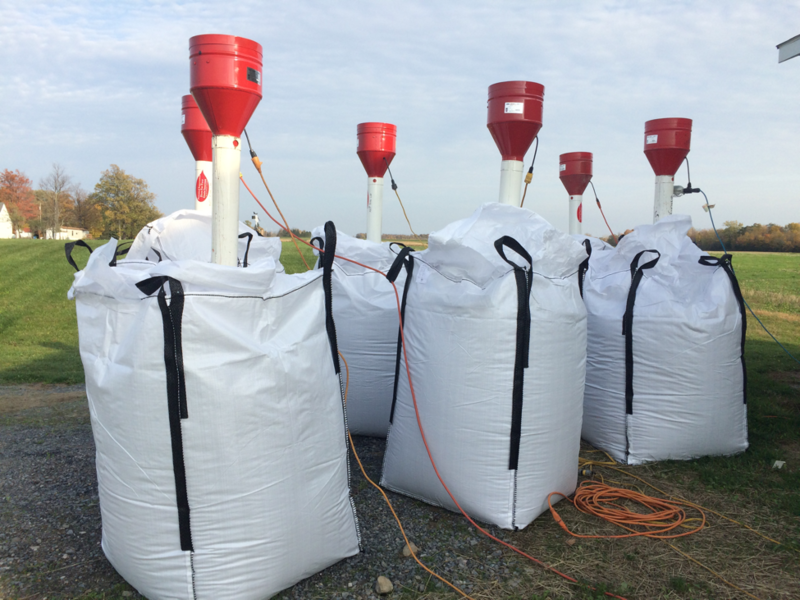 We immediately put the harvested seed into 1-ton bulk tote bags and installed a screw-in aerator in each (Fig. 6). This small-scale approach seemed to do a very good job of removing excess moisture and kept the seeds from heating up. Drying temperatures need to be held below 110 degrees F to maintain quality. After 4 days, they had dried down to the 8-9% range, which is considered ideal for storage, so we turned off the aerators. Figure 4. Sunflowers at harvest on November 1, 2016. Figure 5. “Sunflower plates” bolted on to the corn head keep the sunflower heads from bouncing forward and out. Figure 6. Harvested sunflower seed in tote bags with aerators. These were moved under cover. This accomplished rapid, low-temperature drying after experiment harvest. Two more steps remain before they can be processed into sunflower butter. First, they will be cleaned of crop residue, and then dehulled. The seeds were delivered to OANB and they will be in charge of these steps, which we will document. Finally, OANB will process them into sunflower butter and evaluate the quality of the product. Hulled organic sunflower seeds may typically receive a delivered price of $0.90-$1.10/lb. Estimates vary, but the seeds are reported to be about 60-80% kernel. Whole seed yields of 3000 lb/A would produce dehulled yields of about 1800+ lb/A, minus losses during dehulling. The gross returns from such a sunflower crop would be good, but we do not have data on the costs and losses from the dehulling operation. Drying after harvest is critical and may add to costs. Otherwise, growing and harvest costs appear similar to organic corn. More work will be needed in the future to determine yield variability and cost numbers. The dry season of 2016 was perhaps ideal for sunflowers in some ways. First, they appear to have a good competitive advantage against weeds under dry conditions. Second, dry weather minimizes the occurrence of white mold, Sclerotinia sclerotiorum, which can affect all parts of the plant. It can also infect soybeans and reduce yields and quality of this valuable crop. We did not see white mold in 2016. Sunflowers can perform well and mature even if planted in early- to mid-June, making them a valuable option when wet soil conditions delay planting outside of the optimum corn and soybean window. They also do not need high fertility levels and provide diversity within the rotation, with the important caveat of being a host for white mold. Our 2016 agronomic results were favorable. Later this winter, we will also find out processing results from OANB for these varieties. We need to determine the performance of sunflowers in wetter growing seasons. 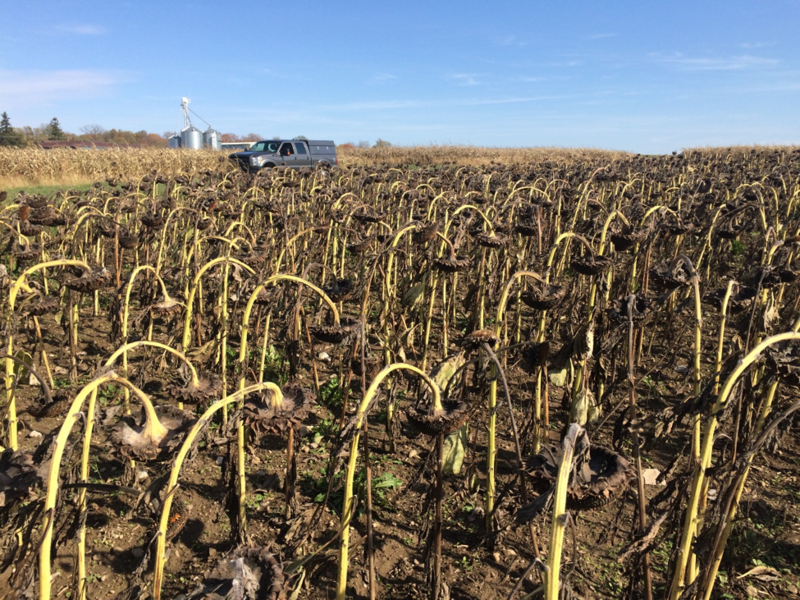 Other factors we hope to examine in the future are whether they will tend to increase white mold on soybeans within the rotation, and whether sunflower pests (including birds) and diseases will increase. This project was undertaken with the generous support of the Once Again Nut Butter Collective, Inc., Nunda, NY. Seed was provided by Nuseed US, Alsip, IL.